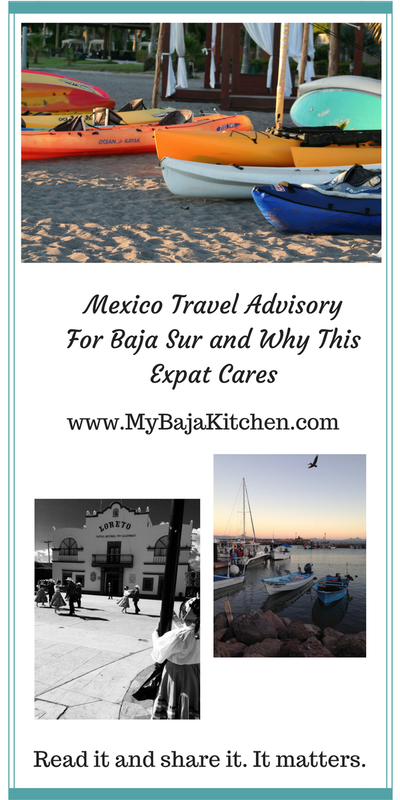 Mexico Travel Advisory For Baja Sur, Mexico and Why This Expat Cares – What's for dinner, Doc? The U.S. Department of State issued a Mexico Travel Advisory for Baja California Sur, Mexico and Why This Expat Cares. If you stopped to read this post because you want to reinforce your fears of travel in Baja Mexico then stop reading and stay home. I won’t try to change your mind. The U. S. Department of State issued a strong Mexico travel advisory this week for the entire state of Baja Sur after three more people were killed in a popular tourist area, Palmillo Beach, between San Jose Del Cabo and Cabo San Lucas in broad daylight. You can read all of the Mexican travel advisories here. These sensational killings fuel the fear in the fearful. If you want to be afraid then I can’t help you. Fear is fear. I can’t remember a family or neighborhood gathering where I didn’t get warned about the dangers of living in Baja. There have been over 600 homicides in LA County this year. There were 3 homicides within 5 days in Reno, Nevada this June. The U. S. allows anyone and everyone to carry a gun these days and mass shootings of innocent people are all too common, even in small safe towns, my small hometown of Carson City, Nevada had a mass shooting at a Denny’s. I once felt safe there. I am honestly more afraid of dying from gun fire in the U. S. than I am in Baja, Mexico. The homicides per capita are high in Baja and the number of homicides in Baja Sur has quadrupled this year compared to last year. These are facts, that I can’t argue against. I’ve seen the increase and impact on my community. I live several months every year in Loreto, Baja California Sur. The LA Times reported that there have been 232 homicides in Baja Sur this year. While I was living in Loreto last fall and winter there were at least six people murdered in my town. One happened near the Sunday outdoor market, where I was buying produce during the shooting. Three more occurred behind a popular hotel around midnight. Another executed man was tossed from a moving vehicle on the highway near my home at mid-day. The struggle is real and I’m not sugar-coating it for you. Absolutely not. I don’t think about these drug related turf battles on a daily basis any more than I think about the homicides in Reno, Nevada. What I do worry about is the impact the Mexico travel advisory and the sensationalism of the homicides will have on tourism in the region. We have friends who rely on tourism to survive: boat captains, restaurant owners, produce vendors and hoteliers. I worry about friends who have children that might get sucked into the drug trade; a drug trade fueled by America’s endless need for drugs. I worry that Mexicans are dying. I worry that the Mexican government can’t seem to stop the killings. I worry that journalists are dying and can’t be protected when they report on the cartels and/or the corruption they see in some of their police and military protectors. We shouldn’t forget that there are great people doing great things in Mexico to combat the killings. There are even grass roots efforts to improve and protect communities. Believe me, Mexicans do care. I don’t worry about expats getting caught in the cross fire an event which is extremely rare. I use caution and so should you. Never travel at night, mostly because of road hazards and large animals on the road, but you don’t want to be a victim of a crime of opportunity. Travel in small caravans and look out for each other. Consider renting or buying a satellite phone for use in remote areas, including most of Highway 1. Cooperate at all military check points. Smile and let them search your car. I applaud their efforts. Be cautious about stopping at distractions along the highway. False road blocks, fake accidents, bumping your car at high speed. Try to keep driving. These apply worldwide including in the United States. Travel with friends, especially at night. Protect your wallet or purse. If you feel uncomfortable then leave immediately. Trust your gut. Drink alcohol in moderation or not at all in crowded areas and resorts. If you hear gun fire, duck and take cover. They probably aren’t shooting at you. Avoid obviously dangerous areas. Ask the hotel desk where it’s safe to wander or take a run. Ask for help. The Mexicans are lovely, family oriented people who are always willing to help. Learn key phase in spanish. I need a doctor – Necessito un medico. I need the police – Necessito a la policia. Share this because there is way too much misinformation out there. I love Mexico and I hope you take the time to learn more and visit this great country. Previous Post I Stopped Cooking In Aluminum Foil, Should You?